Capvidia is excited to be returning to the NIST Model Based Enterprise Summit again. We cannot wait to share all of the presentations and demonstrations we have contributed to this year, with a special focus on QIF and re-using your semantic MBD data downstream. We are proud to work with industry leading technology providers like ZEISS, PTC, Siemens, Kotem, Net-Inspect, and Origin International on some of the MBE technology that will be demonstrated at this event. Additionally, there will be papers and presentations on MBE workflows implemented in a DMDII project (now MxD) involving Lockheed Martin, Rolls-Royce, and others. Also, Action Engineering will present on some MBD work they are implementing with other industrial end users. All of these are powered by Capvidia technology as a key enabler for semantic MBD interoperability. And don’t miss out on the DMSC’s important vision for “Why QIF Matters." Summary: In this presentation, you will see a cross-domain MBD implementation which ties together design, analysis, manufacturing, measurement, and maintenance/repair/overhaul (MRO). The project run by MxD (previously DMDII) and involves major players in industry like Lockheed Martin, Rolls-Royce, Siemens PLM, PTC, Capvidia, and others. Summary: Action Engineering will present on an important MBD workflow that they recently deployed for a major tier 1 manufacturer. This QIF-based workflow is able to maintain the digital thread from OEM down through the supply chain, and then back upstream. Don’t miss this presentation for a vision on how current technology can be leveraged to implement large-scale MBD workflows in enterprise. Summary: ZEISS and Capvidia will be demonstrating robust, standards-based MBD interoperability for their CALYPSO software. 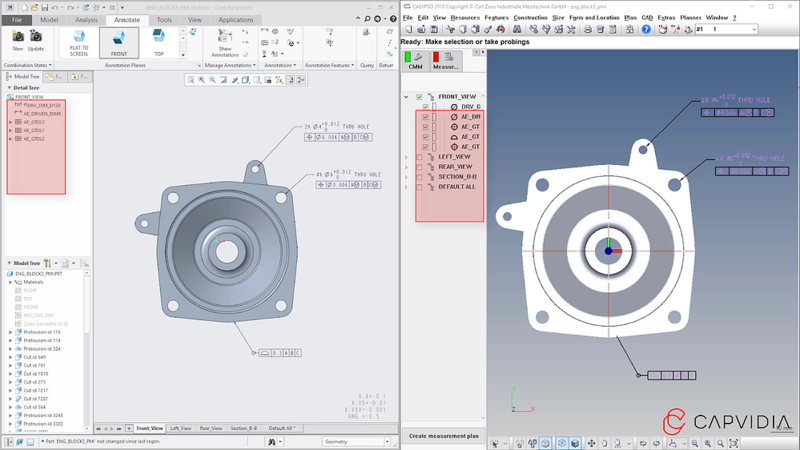 In the demonstration, data will be exported from PTC Creo using the QIF standard. The QIF MBD model will be imported by CALYPSO using Capvidia technology, and will enable the automatic generation of a CMM program from the GD&T embedded in the PMI. All the users of CALYPSO out there will want to make a note of this one. Summary: This demonstration from KOTEM will show the latest in semantic MBD support with the EVOLVE suite of software. Capvidia has worked closely with KOTEM to help enable direct connectivity to CAD systems for EVOLVE users. See how the KOTEM EVOLVE suite can guide you from the design process all the way through measurement. Summary: Come view the latest in MBD software technology as Capvidia demonstrates an end-to-end workflow from design to manufacturing and quality, and then how data is fed back to the design. 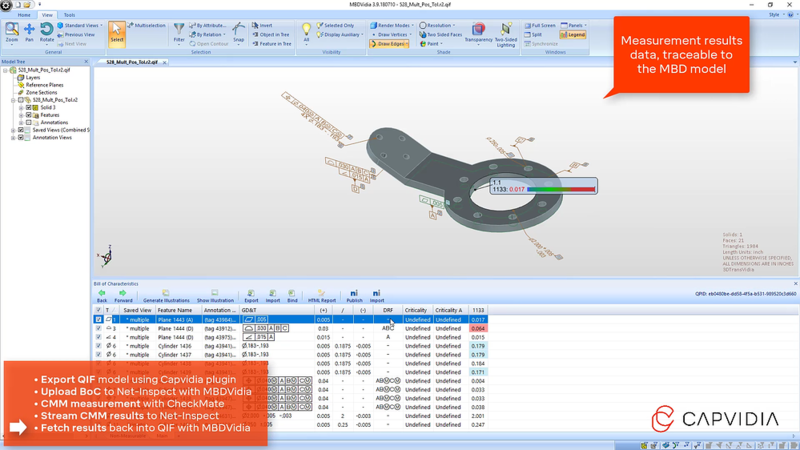 See how easy it is to get started with MBD workflows, and start saving time right away. We think that you’ll be surprised. Summary: Join the discussion as various leaders in industry sit down for a round table to discuss the challenges and success stories of putting MBE into practice. This open discussion will feature industrial end users, technology vendors, and members of academia and research institutions. It will be a great opportunity to learn about QIF and MBD, and also just to network with like-minded individuals. Summary: The Digital Metrology Standards Consortium (DMSC), the standards body which governs the QIF standard, will present its vision for digital industry in the age of Model Based Enterprise. The presentation will give an overview of how industry can benefit from the QIF standard and MBD, and why we expect that all major manufacturers will soon have QIF on their roadmap. Summary: This demonstration shows how the digital thread can be extended across the supply chain. Using Capvidia-generated QIF data and the Net-Inspect platform, and Origin International’s CheckMate CMM software, you will see how design data can be seamlessly transmitted downstream to enable automation, and then how the measured product data can be fed back to the 3D model. When you talk about the feedback loop back to design — this is how it happens. We hope to see you there! If you will be at MBE Summit and would like to schedule a personalized demo, please contact us and we’d be happy to set one up. Not attending MBE Summit this year? No worries! Check back on our website after the conference for more information about the papers shared and videos of the demos given at MBE Summit.